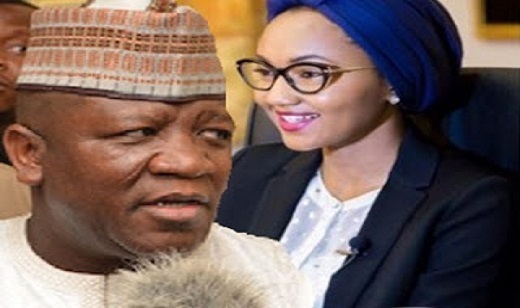 President Mohammadu Buhari has allegedly given a serious warning to his daughter, Zahra Buhari, to stay away from Governor Abdulaziz Yari of Zamfara State who has made several moves to marry the pretty daughter of the President, Presidential Pointblanknews report says. The Zamfara Governor is currently at the UN Millennium Hotel, New York, where the President and his families are lodged as a member of the Federal Government’s delegations to the United Nations General Assembly. Zahra turned 21 December 18, 2015. Governor Yari claimed in his biography that he was born January 1, 1969. According to the report, Governor Yari said to be desperately interested in marrying Zahra to boost his political chances is using the opportunity of the U.S trip to fine tune his marriage plans and sending emissaries to persuade the President to rescind his earlier stonewalling. Sources close to the presidency reveal that the Zamfara Governor has gone as far as dolling out gifts to the first lady and other members of the Buhari family. He is also alleged to have funded the First Lady’s recent Hajj trip to Saudi Arabia with $1million. Governor Nasir El-Rufai of Kaduna State had earlier been rumored to be interested in the President’s daughter. Yari, has as part of his moves enlisted the husband of Halima, elder daughter of Buhari, showered him gifts including awarding him contracts in Zamfara state to persuade the first family into accepting his overtures to marry the President’s daughter who just graduated from a British University. Governor Yari’s desperation to marry Zahra is a subject of discussion in Gusau Government House where senior officials condemn the Governor’s desperation. A Government source lamented that in spite of the lean resources of the Governor, he makes available cash gifts running into several millions to the First Lady, Halima’s husband and other members of the Buhari’s family in a bid to have them convince President Buhari who has frowned at the Governor’s antic. Government House, Gusau, source continued. It was learnt that the Governor argued that the President does not have the moral right to reject his overtures to marry Zahra on account of age because Buhari is over 30years older than Aisha. The Zamfara Governor is notorious with Political Marriages. His third wife is the daughter of Umaru Shinkafi, a popular Politician in Zamfara State. Yari married her to get political blessings for his Governorship ambition. “Yari is a politician who wants to survive at all cost. He married his third wife, the daughter of Shinkafi and got the support of the people of Zamfara because of Shinkafi. Shinkafi is dead now and the people are not happy with him so he wants Buhari’s daughter because that is what may guarantee him survival in 2019,” a source close to the Governor said. Sources also made it known that Yari is eyeing the Presidency or a Senate seat in 2019 and would need to solidify his base by marrying the daughter of the President to edge out any opposition. A source in Gusau said Governor Yari is contemplating taken over from Senator Sani Yerima whose relationship with President Buhari has waned. Mr. Abdulaziz Yari who runs a haulage business in Washington DC and hardly stays in Nigeria, allegedly collected over N400 Million from the state coffers without appropriation by the State House of Assembly to entertain President Mohammadu Buhari’s visit to the state in July, 2016. His incessant absence from Gusau has almost grounded Government activities and politicians are currently ganging up against him.